Just so you know, I don’t intend to pull a “Jamie Oliver” when it comes to chicken nuggets. I’m neither a closeted buyer of supermarket nuggets nor I will hide McNuggets under my skirt if you catch me nibbling them. Having said that, with Jamie’s Food Revolution spreading around the world, he managed to get one point across, well to me anyway, that good parenting includes making chicken nuggets at home and not buying them. Although I’m not yet a parent, I somehow sensed an encouragement from him to set a good example for the little guests in an upcoming party. 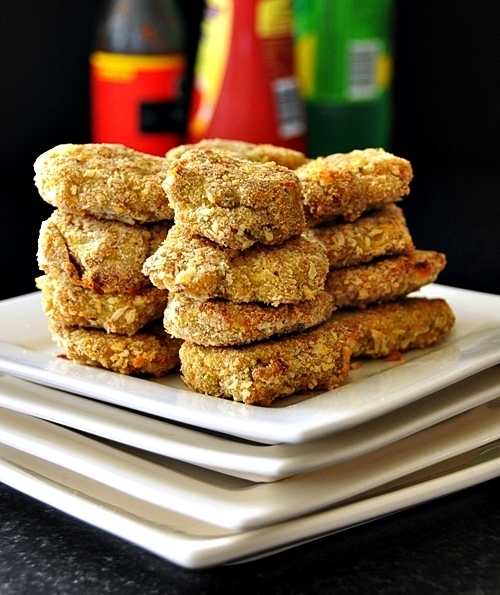 This was my first attempt at making nuggets and for once, I knew exactly what were added to the nuggets I ate. This was indeed a relief and satisfying. I suppose the idea of “cooking from scratch” could sometimes mean time-consuming and lots of hassle but making nuggets from scratch wasn’t as bad as I thought (as long as you don’t compare to supermarket nuggets where you just pop them into the oven and ready to eat :P). At the end of the day, knowing what you eat does count for something right? If not our sake, at least for the sake of the little ones, yes? 1. Preheat oven to 200 degrees Celsius (392 degrees Fahrenheit). Line a large baking tray with baking paper and spray or drizzle some oil over it. 2. 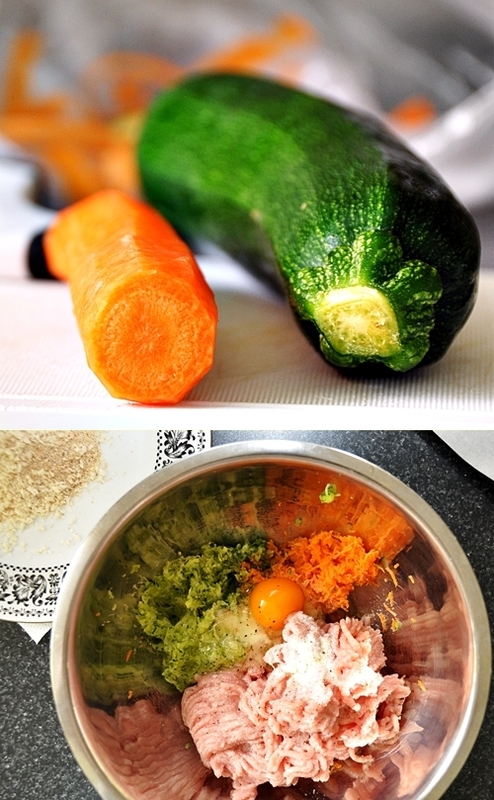 Using your hands, squeeze grated zucchini to remove excess liquid. Places zucchini in a large bowl. Add mince, carrot, corn (if use), semolina and egg. Season with salt and pepper. Using your hands, mix until well combined. Wash your hands after this. 3. 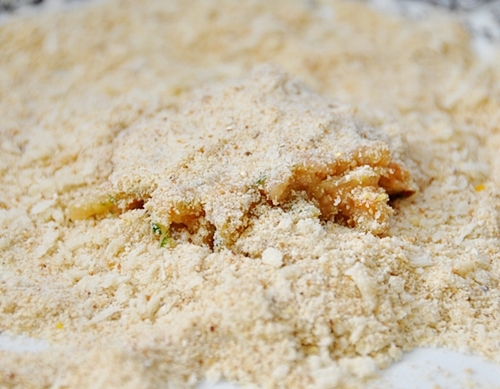 Place breadcrumbs on a large plate. 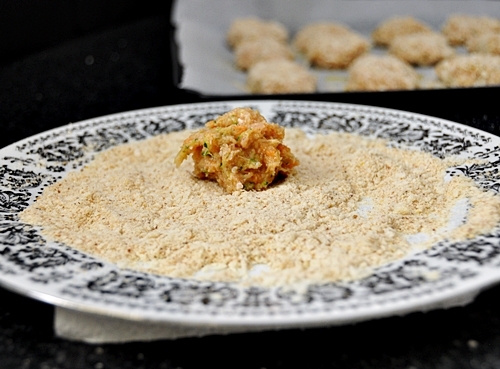 Use one hand to shape about a tablespoon of mixture into nuggets. 5. 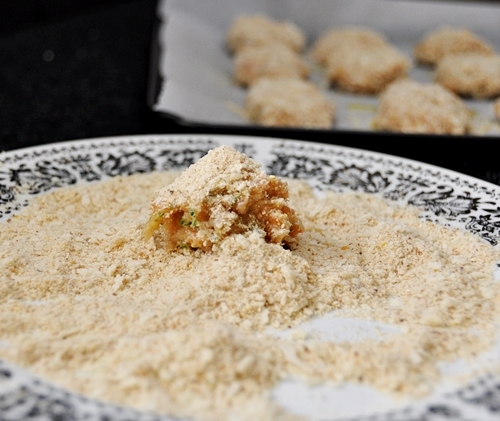 Flatten the chicken mixture in the breadcrumbs like the photo below. Make sure all the sides are covered in breadcrumbs. 6. 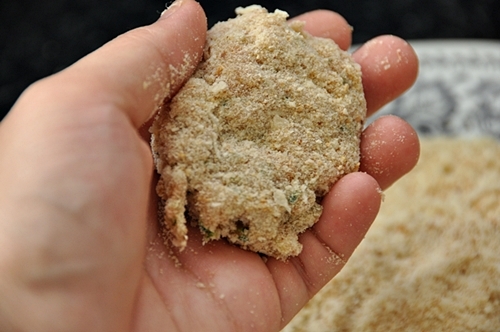 Lift the breaded chicken mixture and try to “smooth out” the edges. 7. Continue step 3 to 6 with the remaining mixture. 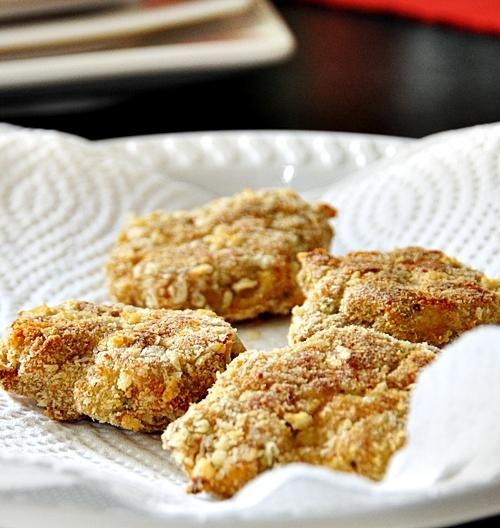 Spray or drizzle nuggets with oil. 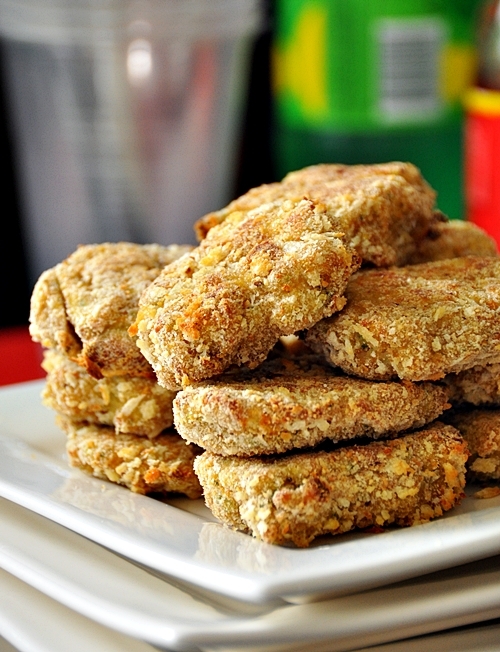 Cook for 15 to 20 minutes, turning the nuggets halfway during cooking or until golden and cooked through. Freezing options? 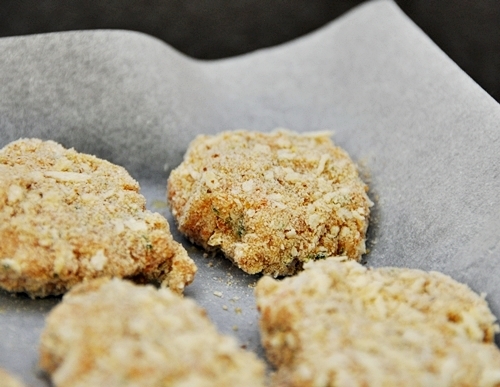 As suggested by taste.com.au, freeze the uncooked nuggets at the end of step 2 by dividing nuggets between 2 large zip-lock bag, label, date and freeze for up to 3 months. Alternatively, my preferred option is to freeze the cooked nuggets and reheat when you’re ready to have them. Follow the instructions from here. Nice! I, too, have paid attention to Jamie Oliver…My kids would eat these and never realize they’re nutritious! What a great way to sneak in vegetables without them knowing. I’m definitely going to give this a try on a friend who is a very picky eater. Hopefully he doesn’t notice them too much! I’m definitely a fan of “the Revolution” and these chicken nuggets sound so good! I’m not a kid, not do I have any, but we would definitely find ourselves eating these all the time! These totally remind me of the Shake-N-Bake chicken nuggets that my mom used to make me and my siblings when we were kids. It was my favorite thing in the world. I don’t have any kids either but I totally agree that we should know exactly what is going in our mouths (and theirs in the future). It’s time consuming, but important and worth it. Plus, it’s more fun! These are awesome, kids are going to love them, thanks so much. Ok, these look awesome. Making them for sure. Hopefully my three year old will like them. If not I know I will. There are vegetables in these guys?! Keep your fingers crossed, if all goes well, this will be a regular at our house. These are my FAVORITE recipe for chicken nuggets. My toddlers loved them and my husband ate half the recipe! Definite hit in my house.